Once ideas are generated during the initial discovery phase, a project moves to the design stage; engineering is the implementation of that design. This is the stage where we choose the software, electronic and hardware platforms, technologies to optimize efficiencies, and execute the pre-production engineering to test the project. Ensuring reproducibility is critical, so we prepare all accurate documentation associated with each process. In short, our engineering services comprise putting the pieces together and making the design work. 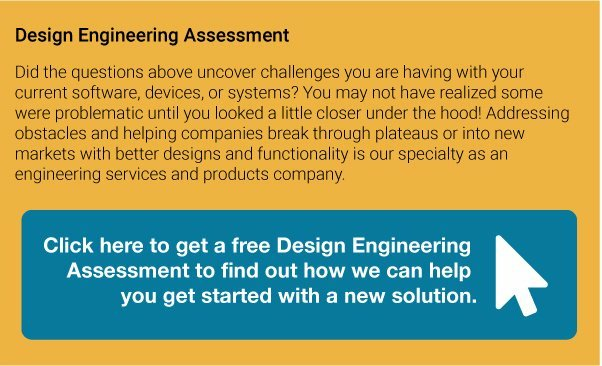 Process is an important element in the engineering mindset, so we’ve put together information to shed insight on our perspective and help you figure out if and when you might need engineering services for some new operational solutions. Read sequentially or click on each link to go directly to the respective section. When Is it Time to Engineer a New Design? Many of our projects are low-volume in scope. These types of solutions are not intended for large-volume production because they are custom solutions designed and engineered to solve a unique challenge a company is facing with their product. For start-ups or established companies, growth, market changes, and technological innovations are inevitable. There will always be growing pains, application limitations, scaling challenges, and diverse industry adoption needs that require engineered technologic solutions to help advance. These are exactly the kinds of engineering solutions we partner on with customers. Patent-holding inventors at our core, we create engineering solutions for new innovations. Companies also seek our design engineering expertise when they are looking for a new way to perform an old task, or need new functionality using existing technology that is robust enough, but needs an upgrade in capability and capacity. We are innovative engineers who design a unique solution and then create the engineering and documentation that can be passed on to the contract manufacturer or in-house manufacturing team. For large-volume production, we partner with our industrial designer to prepare the project. Our working model and prototype demonstrates efficient production capability when the project is going into mass production. Industries we work with span medical device, industrial, BioPharma, IoT, and defense, including the U.S. Navy. Enginasion developed the electronics and software controls for a new Powder Dispenser System for inhaled insulin. How do you know when it’s time to upgrade or replace your current technology—whether it is a control unit, embedded software, production hardware, wearable sensor, IoT device, or other electronic component or system? Here are some questions that you should ask of your current operations; or you’ve been asked, but don’t have the answers to. They are very broad and can cover a variety of operations—think of them in terms of your specific applications. If you can’t answer them, it’s an indication to consider upgrades and improvements in the near future. Technology advances so quickly that if you are one step behind today, you will effectively be three steps behind within the year. Are you getting accurate results? Among other applications, this can apply to count verification systems, production totals, quality screenings, or electronic medical device monitors. The secondary question is: do you have a way of actually verifying accuracy? Are there any built-in redundancies to your system that alert you that accuracy is off? How reliable is that redundancy protocol? Are you able to reach quota? Are production numbers where they should be? There are many reasons this could be off, but addressing any technological obstacles that may be hindrances is a wise place to start. Are you experiencing quality issues? Consider integrating your quality oversight systems so they can communicate with each other, alleviating disconnects that can result in quality problems. Is your current operating system or production process fully integrated? Are there any inconsistencies or shortcomings attributed to a design that requires multiple “daisy-chained” steps? With any discrepancies, you need to fully understand where the source of the problem(s) may be coming from. If your system is not seamlessly integrated, you need to assess where the vulnerability lies and how to reconcile that within the greater system to maintain integrity. Are manual controls too time consuming and imprecise? Designing an embedded software system to automate functions will improve efficiency and help save time and resources. Chances are, if you are required to provide more than minimal manual oversight to run and maintain your current system(s), there are better, more contemporary and efficient alternatives out there for you to explore. Issues such as set up, cleaning, monitoring, and maintenance should be one-touch operations and seamlessly integrated with the overall system. Is your current machinery or system the right size for your facility? As businesses grow, sometime operations outgrow a space before a company’s ability to move into a larger space. Is your current set-up able to physically scale for larger duty? Or do you want to streamline operations and find a way to downsize the system or machinery while better utilizing the space you have? How flexible in configuration is your current operation? How scalable is your system? We’ve addressed the physical nature of company growth—and there is also the product diversification factor to think about. Your company is growing! You’ve gone from three products to nine; 11 to 23; 120 to 300. Can your system keep up? Does it have the capacity to scale all this intel? Are you planning on growth into different markets? If you’ve thought that your product or service would be perfect for another market or industry but need to find a way to reconfigure it so it is accessible or applicable in another form (as in: Blue Tooth 5 (BLE5) technology, flexible electronics, wearable RFID sensors, and IoT solutions), there is a good possibility we can engineer a solution. Might there be options to produce better results with less parts, saving costs? It’s always a possibility and worth investigating. Here’s a quick example: a defense contractor working with the U.S. Navy ran into what seemed like an impossible roadblock when tasked with designing electrolytic oxygen generators that decompose water molecules into hydrogen and oxygen gases providing oxygen for crew life-support and operation sustainability. He asked Enginasion to design a smaller, more user-friendly, and cost-effective system controller that would benefit the U.S. Navy’s submarine fleet. We designed a controller that included full automation of graphical user interface (GUI) prompts for required operator actions; built-in diagnostics; data and trend analysis and software interlocks; the elimination of over 12,000 parts, reducing costs; and a reduction in operation noise. Enginasion has collaborated with many different customers from diverse industries for over 40 years. When configuring a solution, we first listen to your situation, challenges, and goals, and then pool history with the latest technologies to engineer new solutions with solid foundations. It could begin as an initiative to upgrade technology and end up improving efficiency and outcomes beyond the original scope of the project. We approach every new opportunity from multiple perspectives, offering a diversity of talent, experience, and skill for creative solutions. We can adapt and create technologies to answer your unique needs—we engineer unique solutions this way all the time. "Certainly, Enginasion has helped us for two decades to fortify this legacy of bringing innovative solutions to meet emerging market needs."